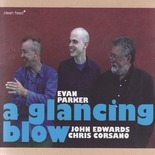 A sort of straight-forward Evan Parker trio set, I think recorded live at the Vortex. The first thirty minute piece: Parker sounds quite cool, fairly broody; someone (presumably Corsano) plays around with some sort of pipe, or disconnected mouthpiece, in parts, with Parker matching him there with an almost bagpipe drone. Parker also seems a bit, er, uncharacteristically melodic (which is nice). John Edwards plays a fairly forthright bassline throughout, with plenty of hard scraping, twanging and body-slapping. I’m not sure I’ve ever actually heard Corsano before, he sounds alright here, a bit like a more laid-back Paal Nilssen-Love. The second forty-five minute track is less compressed-together, with quite a lot more space. It’s also a little bit less of a melting pot, coming out more meditatively thoughtful. I have recently tried to move my blog to a new server… and upgrade the software… and now everything is broken. Please let me know if you notice anything not working properly (comments failing, in particular). Please let me know directly, at matt@purplebadger.com. Cheers! It’s been a good month for Big Historical Names; after Ornette Coleman, and Cecil Taylor, now: Rashied Ali, with his Quintet, at the Pizza on the Park. And a bit of a change to get to see a big name american act in a much more intimate venue. Rashied Ali probably isn’t as big as Ornette or Taylor/Braxton, but Interstellar Space is one of the most important (and frequently played) records I’ve ever bought (being as it was one of the first sounds to push me into complete musical Freedom)… and like the big anticipated RFH acts earlier in the month, he didn’t let me down. First off: a word about Pizza on the Park… My first visit to a ‘proper’ London jazz club (basement, no windows, waitress service)… Why haven’t I checked out this place before? Great atmosphere (although, also, in parts, a bit cliquey, and theme-parky). Pizza on the Park is essentially a Pizza Express gig, so the same just-slightly disappointing pizzas, but ok… However, the service itself was really chronic, which was seriously annoying for the sort of place where you can’t go and just dig it out yourself. Although probably suffering from single-diner blind-spot syndrome, would have been nice if my waiter could have actually bothered to get me at least one alchoholic beverage during the four hours I was sat there (or a desert! or a cheque at the end!). Anyway, not wanting to put too much emphasis on this point, but it was a bit of a downer, and makes me feel like it’s not really the sort of place I’d want to visit unless I knew the band was going to be great. Rashied Ali was playing with most of the quintet off his Judgement Day record (I need clarification over the trumpeter). Fairly typical feel overall; the sort of contemporary hard-bop sourced music that most of the American Names are probably going back to, to mostly bide their time… A kind of broad Blue Note, sixties/early seventies vibe. But totally solid. The trumpeter was playing the most Inside, but with really powerful lines. Maybe it was because he was playing straight into my face, but… trumpet usually leaves me wondering why? ; this was cool. Lawrence Clark was an impressive soloist, on tenor, fast runs all around his horn, overblowing at the top and at the bottom, with the odd strains of Coltrane seeping through (that’s a cliché; Clark was not, and really had his own sound). At the same time, not just going through motions, he had a solid grasp on the melodic construction (in fact, I think he was responsible for quite a few of the band’s actual charts and tunes). Towards the end of the second set (possibly on a performance of Judgement Day itself), the band pulled back for a time leaving a Clark–Ali duo, and the tumbling (and unpredictable) sheets of sound moved closest to JC territory. That little part, probably the highlight of the night. The bass was a little lacklustre, but then he was having to make do with a slightly battered electric bass, having an even more battered double bass lying in a heap somewhere on the tarmac at Heathrow airport. The pianist, Greg Murphy, played formative lines, freaking into some unexpected blast crashes every now and then, showing signs of something more free… Underpinning all this, of course, Rashied Ali. The rest of the band may have been playing on the Inside, but Ali stuck to free scattering pulses, firing out shots here and there in patterns that were only just obviously related to the group form, bringing the staid-in-principle choice of set list into something, really, Else. It was amazing how powerful his sound was hitting me, all from barely perceptible motions of the sticks; it was almost like artillery going off. Fairly unique, I can’t remember seeing any drummer play like him, and he was completely and utterly mesmerizing. Although my Rashied Ali record collection is generally far more free than this, and the traditionality of the group was slightly suprising, it all worked brilliantly, with Ali’s own freedom drive making it all that little bit more special. I only really know Moholo (or, Moholo-Moholo, if that’s more appropriate), specifically, from his playing with the Evan Parker/Steve Beresford/John Edwards quartet Foxes Fox; he was with them at the Vortex last year, I think, playing his ‘last’ gig before moving back ‘permanently’ to his South African homeland (a performance, I notice, currently being prepared for release on Psi records). This group was something completely different, and quite a unique musical experience, a celebration of more traditional (inverted quotes, probably) free-Jazz (with a capital ‘J’) rather than free, free improvisation… Stylistically sounding like no other band or music I’ve ever actually seen, only heard, on dug-out records put out by artists either having some understated civil rights message, or a tendency to walk around on stage wearing robes of gold. Anyway, whatever, completely marvellous.